How feasible is “sustainable energy for all”? In a recent paper in Nature Climate Change, an ERG team shows how this moment in history is a unique time to see the UN’s energy vision come to fruition. 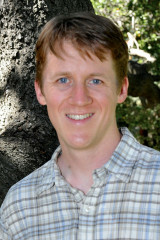 Lead author, ERG PhD candidate Peter Alstone, shares with us what he believes is next for global energy connections. A scene from summer 2014 field research in Kenya: Mumbi, a research assistant, uses a tablet computer to survey a man who sells off-grid solar devices among other goods at his retail shop. 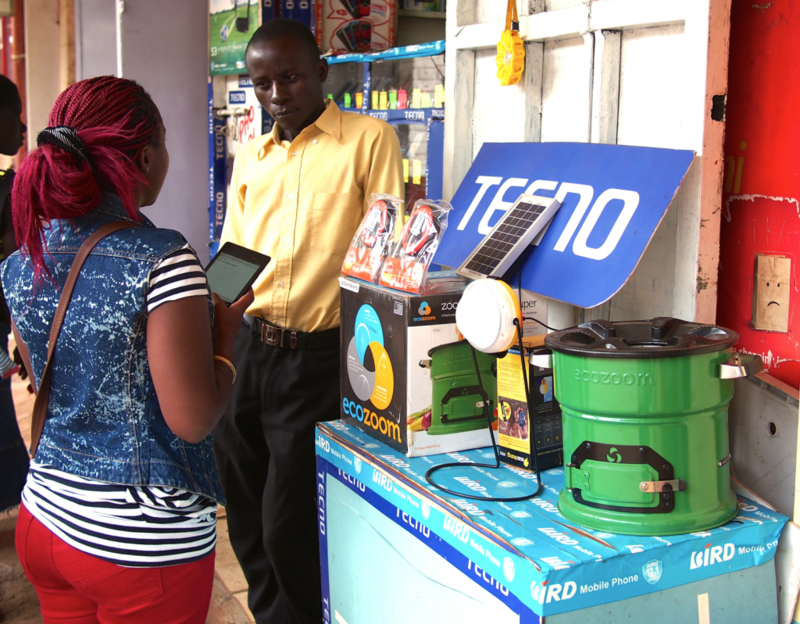 The team surveyed over 100 retailers across Kenya and found significantly increased access to pico-solar products for sale compared to previous surveys of the market. The paper highlights that now is a “unique moment in history.” What makes it so and why did you feel compelled to emphasize this in the paper? Our paper reviews the state of knowledge on a continuum of on- to off-grid electricity technology systems, using a combination of historical and applied systems analysis to datasets we curated across scales. We found that there are nearly as many people off the grid today as there were when Thomas Edison started selling electricity in 1882 — over a billion. While extending connections to the grid provides low priced, high power, and often reliable electricity, overcoming the cost and investment barrier for extensions and new connections has proven difficult, particularly for the poor. There are nearly as many people off the grid today as there were when Thomas Edison started selling electricity in 1882 — over a billion. The unique moment is a confluence of several technology systems, like LED lighting, PV power, and mobile connectivity. Now, it is possible to compete against the old systems of kerosene distribution, expendable batteries, and fee-based recharging that were very recently the cheapest way to get small amounts of lighting and electricity. Scalable and inexpensive solar energy systems (from 1 watt to 1,000 watts) can replace unhealthy and low-efficiency flames with efficient lighting and — depending on the power level — provide additional, highly valued services, including mobile phone charging, television, fans and other basic energy needs. The paper delves into the nexus of energy, sustainability and poverty. What do you think are some of the main take-aways for policy makers from the paper? Pervasive deprivation from electricity for the off-grid poor has (too) long been recognized as a critical issue for development policy and off-grid solar is an opportunity to make progress on both development and climate. We found that off-grid households end up contributing 10x the emissions levels of those with either grid or off-grid electricity, while enjoying none of the benefits from far superior service that is possible. The trajectory of new market-based approaches (with a mix of subsidy, support, and enabling environments) could accelerate access to clean and highly valued off-grid electricity service. Policymakers should extend and expand efforts to support off-grid power. We found that off-grid households end up contributing 10x the emissions levels of those with either grid or off-grid electricity, while enjoying none of the benefits from far superior service that is possible. One of the critical needs for progress on off-grid electrification is financing for the systems. Many people in the off-grid world are spending enough on kerosene or batteries and phone charging that if you just turn that spending stream into loan repayments, depending on the interest rate the “average” off-grid household might be able to afford a $50-200 system without any increase in cost and substantial service improvements. This can help overcome a first-cost barrier that really slows adoption. A very promising new application for providing consumer finance is “pay-as-you-go” solar power systems. These approaches leverage mobile data and mobile money systems to collect and enforce small loans with systems that have embedded hardware for verifying the payments. It solves one of the hard problems in microfinance, which is enforcing loans that are small enough to offer widely with very little (or zero) credit history required. Getting consumer-level finance for solar into the hands of the off-grid poor could be transformative in meeting targets for universal access to basic energy service, if the supporting environment for policy and access to capital is in place for off-grid solar businesses that would need to grow quickly to meet their needs. The paper also features something called “pico power.” What exactly is pico power and how can such small generation have a large impact? There is not really consensus on how to describe the range of small-scale off-grid solar power systems that are being distributed now. There is a huge range in form, size, and kinds of appliances they power. Pico-power (or pico-solar) is one of the ways people who are involved in manufacturing, distributing or supporting the market describe the devices that go up to about 10 Watts for the size of the solar module. One of the key things to keep in mind is that while 1 to 10 Watts doesn’t sound like much (and it isn’t compared to the power we have from the grid — 1,000’s of watts continuously if we want it), it is meeting very valuable and high-priority needs. So, the impact of the first several watt-hours can have outsize impacts on people’s lives compared to the average few watts of power used on the grid. Paired with super-efficient appliances, this off-grid power can be stretched even farther. For your research, you also travelled to Kenya. What did you hope to uncover from your field work and what insights did you gain? I count myself as very fortunate to be able to be in places like Kenya, where I learn an incredible amount from the people I meet and work with on research. The field work we did last summer focused on a detailed look at pay-as-you-go solar in Kenya, which is the first country where that approach is really taking off. We also talked with people across the country at different levels in the supply chain and the users to understand the dynamics of the solar market. There are more detailed papers coming out of this work as well. Having this detailed view into one market along with some global perspective is how we approached the higher-level analysis. After this paper, what questions do you hope to pursue? What’s next for you? I’m working on the next few papers coming out of this work and started this year to also do some work on responsive loads for the grid — so, a combination of on- and off-grid work at the intersection of information technology and clean energy. I will be joining LBNL next year for a post-doc fellowship, continuing in that vein of work. The paper is co-authored with Dimitry Gershenson (MS’14) and ERG professor Daniel Kammen. For free access to read the article anywhere, go here.